When I first saw these Afternoon Tea chocolates from Sent With a Loving Kiss, I was smitten and got very excited. This may not be a closely guarded secret, but I do have a weakness for afternoon tea. I am far more likely to give a tea party than I am a dinner party and if ever anyone wants to take me out (which doesn’t happen nearly enough) afternoon tea is what I would choose for preference. Luckily, I didn’t need to drop heavy hints to my nearest and dearest as I was sent a box to review. Inside the box sat a cute little tin decorated with colourful teapots. When I opened the tin, the enticing smell of sweet chocolate leapt out at me and I was hard put not to take a bite immediately. 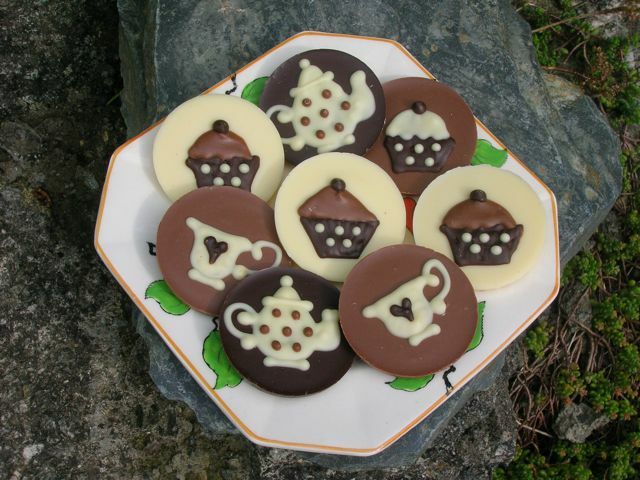 The tin consists of twelve chocolate discs playfully decorated with dainty cupcakes, teapots and milk jugs: two dark, four white and six milk – something there to suit most tastes. Much as I wanted to dig into these straight away, I am being very restrained and saving them for a future afternoon tea party, or even for decorating an extra special cake. Apart from the afternoon tea theme, I particularly liked being able to personalise the tins with my own messages. For my tin, I asked for the inscription “everything stops for tea”. I should have added “and if it doesn’t it ought to” but foolishly omitted that bit. This makes for a nice keepsake for the recipient once the chocolates have been demolished. I’m looking forward to using mine as a fun container for homemade biscuits or even chocolates. These delightful chocolate discs are one of the many unique gifts available from Sent With a Loving Kiss which can be sent as a thank you, birthday present or for any other occasion desired. Other similar chocolate tin sets that caught my eye include Garden Party and Shopoholic Chocoholic. Tins come in all shapes and sizes, however with varying chocolate contents to match. Handmade in Hampshire from Belgium couverture chocolate, the ingredients are of good quality, containing no vegetable fat and only natural vanilla. The dark chocolate contains a minimum of 53% chocolate solids, the milk 33% and the white has a minimum of 28% cocoa butter. The chocolate weighs in at 125g and the tins can be personalised to give your own special message. At £19.99, these are not cheap, but they are an enjoyable, quirky, individual gift that I think would make anyone’s day. Sent With a Loving Kiss have kindly sent me a second box to offer as a giveaway on Chocolate Log Blog. To be in with a chance of winning a box of Afternoon Tea Chocolates inscribed with “With Love From Choclette”, please fill in the Rafflecopter below. You will need to leave a comment on this post which then gives you additional chances to enter if you so wish. Rafflecopter will pick a winner at random from the entries received. Please give me some way of identifying you in the comment section as I will be verifying the validity of entries and will always check back to the comments to ensure that part has been done. Any automated entries will be disqualified. This giveaway is only open to those with a UK postal address. You need to be 18 or over to enter. Winners will need to respond within 7 days of being contacted. Failure to do this may result in another winner being picked. Prizes are offered and provided by Sent With a Loving Kiss and Chocolate Log Blog accepts no responsibility for the acts or defaults of said third party. Birds! – I’m a bird lover so this would be an obvious choice for me! Flowers – I adore floral decor! Cupcakes! The afternoon tea set looks gorgeous – love afternoon tea too. I’ve always loved the chocolate animals you can buy at National Trust properties, so I would probably decorate the chocolates with animal images. Butterflies – so many pretty patterns. I’d have bikes, and give them to the boy for his birthday. A seaside theme would be my choice – sailing boats, sand castles, fishes, etc. I would have flowers on mine as I am getting into gardening. Cats – one of my many passions. I would go for a clothes theme as i am in love with fashion! Storks, soothers, rattles, and all things baby! I actually love the afternoon tea theme. I would give them to my mum who is a tea-aholic! I’d choose the garden party theme. I’ve recently returned home from university to Edinburgh, and my parents’ garden is lovely! Cars – my son would love them! A garden one for my mum. Little knives, forks and spoons. I’d love butterflies on mine. I know this is copying from an above comment but I do think Fairies would look magical!! These are lovely, I would choose butterflies. I would like something girlie for my daughter, fairies would be fab! For a Bon Voyage gift… planes, trains and buses! Actually, I love the teapot and afternoon tea characters that you’ve pictured! Failing that, as a gardener and veg grower, I’d have to have some veggies and flowers on my chocolates! Yummy giveaway and good to know this company exists, thanks! Summer – as it’s been so lovely I don’t want to see it go. butterflies because my daughter loves them. Shoes, the girls are all shoe mad in this house. I would have arty things like paintbrushes and pots of paint. I would love the butterflies. Baby things (as I’m due in 5 days). flu vaccines to encourage my team to have theirs! protect yourself from flu this winter! Fireworks and save them for bonfire night. A hot cup of tea and some lovely biscuits are perfect after a cold night out watching the show. And I know he needs nothing else but my warm embrace. And nudges me with his nose. Thank you Linda, that’s just lovely. I have three cats so I would choose cats as a decoration. The world has gone mad for westie dogs and I’m one of them too, I now have 2 of them, so I would have cure little westies on mine. Would have to be a mixture of cats and dogs – we have 7 cats and 2 dogs and foster for the Irish Retriever Rescue charity – so wouldn’t be able to choose between the two! Characters from Animal Crossing since they are so cute!